I'm wondering if the MBDA Meteor will fit into F-22's main bays. Each bay can carry two AIM-120A without the clipped fins, and it appears as if the Meteor has roughly the same dimensions in length and diameter. Also, does the side bays have enough room to carry the Python 5 since it's slightly larger than the AIM-9X? Here's the Meteor next to an AIM-9M. Last edited by disconnectedradical on 03 Nov 2013, 12:10, edited 2 times in total. The main bays can only fit 3 x of the AIM-120C with clipped fins. Not 4, and definitely not AIM-120's without shortened fins. structuresguy wrote: The main bays can only fit 3 x of the AIM-120C with clipped fins. Not 4, and definitely not AIM-120's without shortened fins. I meant 4 total, two in each bay. Theoretically there may be some way to cram the Meteor into an F22 but I believe the US has it's own long range missile plans in hand? Meteor for the F35, that's a no-brainer - MBDA would be looking at the international market and probably rubbing their hands at the prospect. The latest version of Meteor, intended for use in F-35, has smaller fins, just like with AMRAAM, so it would fit in F-22 the same way the latest AMRAAM does. delvo wrote: The latest version of Meteor, intended for use in F-35, has smaller fins, just like with AMRAAM, so it would fit in F-22 the same way the latest AMRAAM does. I'm not sure about that. F-35's bays can carry larger weapons than F-22's bays. The main issue is the Meteor's intakes, which protrude out quite a lot. See image below. So I don't know if the Meteor can fit in the F-22's main bay at all. Also, given the Python 5's dimensions, 3100 mm long, 640 mm fin span, 160 diameter, will it fit in the side bays? For comparison, AIM-9M is 2850 mm long and 630 mm fin span and the AIM-9X is 3020 mm long and 280 mm fin span. I'll revive this topic because of some recent reading regarding the AIM-152 AAAM. There has been some contention that the Air Force opposed the AAAM since it won't fit into the F-22's weapon bays. This may be true for the Hughes/Raytheon submission, but the GD/Westinghouse submission of the AAAM has the same cardinal dimensions as the AIM-120. In fact, it might be even slightly smaller. I wondering if these would fit inside the F-22. Also, how would the performance of this missile be against fighters? It seems like a multi-pulse rocket motor can have quite an advantage in terminal maneuvering. disconnectedradical wrote: I'll revive this topic because of some recent reading regarding the AIM-152 AAAM. There has been some contention that the Air Force opposed the AAAM since it won't fit into the F-22's weapon bays. This may be true for the Hughes/Raytheon submission, but the GD/Westinghouse submission of the AAAM has the same cardinal dimensions as the AIM-120. In fact, it might be even slightly smaller. I wondering if these would fit inside the F-22. Also, how would the performance of this missile be against fighters? It seems like a multi-pulse rocket motor can have quite an advantage in terminal maneuvering. There were some potential issues regarding AIM-152 in Raptor's shallow bays. While the source you cite does indicate dimensions similar to AIM-120, remember that some of that was speculative, For example ACIMD is pictured in the article without mentioning that it is much larger than the Hughes entry. Also, the ranges look a bit low. More importantly, while the dimensions cited may indeed be close, don't forget that the GD entry was designed to be fired from the tube it was delivered in, as part of USN's "wooden round" philosophy. I don't believe it was designed for free launch (missile ejected and lights up when clear of the aircraft. It launched more like AIM-9 (AIM launches either way). This, plus the size of the launch tube might be a problem for Raptor internal carry. GD's multi-pulse, or boost-cruise-boost motor did have some good features both in getting range and in the endgame, depending on how far the missile had traveled to that point. OTOH, Hughes' rocket/ramjet combination would be powered all the way and would have plenty of available energy at that point as well, maybe even more (although it would be less agile at its minimum effective range). Both were designed to be highly effective against fighters except at the extreme end of their range. AIM-120 was a Navy missile. Historically AF doesn't like combat systems(rotary wing excepted) that it didn't develop or control. Usually it had to be forced into that by fiat (F-4) or circumstance (AIM-7); A-7 was an exception, but there was a war on. F-22 development was beginning and AF's position was that no such weapon was needed because with the F-22 they could get close enough without being seen that extended range was unnecessary anyway. Besides, with their hundreds of F-22s they would be so awesome that no one else would need such a weapon since AF would have already wiped out everybody. AF arguably also was concerned that AIM-152 might be a threat to F-22 funding. In addition to long range, it would have a high energy state through most of its flight, greater ability to operate in an ECM environment as well as multi-mode seeking. The fear being that maybe some might say that with a weapon like that the US could get by with evolved F-15s or the like. USAF strongly would move against anything perceived to be a threat to Raptor. It is instructive to go back some years and observe how USAF looked on F-35, its role and mission (remember the "F/A-22"? ), and the capabilities that it would have, especially air-to-air taking advantage of F-35's larger bay. This attitude remained up until the point where it was clear that there was no chance of getting more than 187 (boo!). Then F-35 became the greatest thing there ever was. As with almost everything, there's usually never just one reason. Enough blathering by me; my hand's still not healed and using my elbows and nose is not really an option (probably wouldn't look any worse than my usual output, just more tiring. stobiewan wrote: Theoretically there may be some way to cram the Meteor into an F22 but I believe the US has it's own long range missile plans in hand? Yeah, for about 20 years. It's progressed from the drawing board, to the Powerpoint, to the waste bin. There had been studies for a number of years for a longer range ramjet version of AIM-120/AMRAAM, FMRAAM ("Future" instead of "Advanced"). USAF was not a supporter of the concept reportedly for some of the same reasons it didn't like AIM-152. Repeated rumors were that a couple of brassboard examples flew but I can't find confirmation of that. However, when Europe started work on their BVRAAM ("Beyond Visual Range"), the US position changed and FRAAM was championed to get those orders. However, Europe no doubt skeptical of US commitment and wanting to support the home team, went with Meteor and FRAAM ended up in sferrin's waste bin along with AIM-120. And then there's JDRADM...the waste bin is getting crowded, isn't it? So, the USN states that the AIM-120C/D has a wingspan of 19", with the AIM-120A/B having 21". disconnectedradical, if your assertion about the Raptor being able to carry A/B in reduced quantities is correct, that establishes a minimum bay height of 14.849" (assuming 45deg fins and the missile being stored at a diagonal to minimize its profile). The thing is, I can't find a damn thing about the Meteor's wingspan. Its diameter, sure, but a figure of 7.0" is clearly not an all-up wingspan and is therefore basically useless for this analysis. The meteor span is a lot more than the AMRAAM, and I'm pretty sure you won't find any oficcial numbers. It's also not symmetrical top/bottom since the bottom finns are located on the sidepods behind the air-intakes. I personally doubt that the Meteor of the current model will fit inside the bay of the F-22, but that's just my guess. MBDA are working on an clipped fin version to fit inside the F-35 bay, and that version should be possible to fit inside the F-22 as well. 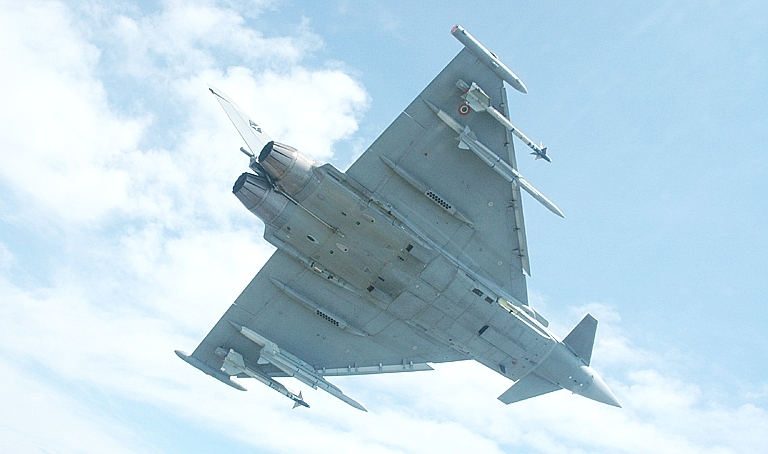 The diameter and length of the body is the same, as well as the attachments, to make it interchangeable with the AMRAAM on the Eurofighter, the semi recession dictated those simillarities. T3 was the latest to go into the circular file. I'm not entirely convinced that USAF was opposed to long range AAMs just because of the ATF. At around the same time as the AIM-152 the USAF had their own AIM-120 replacement program in the Have Dash. southernphantom wrote: I can't find a damn thing about the Meteor's wingspan. Its diameter, sure, but a figure of 7.0" is clearly not an all-up wingspan and is therefore basically useless for this analysis. linkomart wrote: The meteor span is a lot more than the AMRAAM, and I'm pretty sure you won't find any oficcial numbers. It's also not symmetrical top/bottom since the bottom finns are located on the sidepods behind the air-intakes. Images like this one and this one show the fins making a square with height & width 2.3 times the central body's diameter, which means 16.1". linkomart wrote: MBDA are working on an clipped fin version to fit inside the F-35 bay, and that version should be possible to fit inside the F-22 as well. They have their final design and have already revealed it to the public; there was a thread about it somewhere around here. But the announcement wasn't very informative. Not only did it not give dimensions, but even what it did say about where the missiles would fit is open to interpretation, so they still haven't really specified to the public whether it really fits everywhere AMRAAM does. If it's #1, then that doesn't eliminate the possibility of carrying six internally using the same racks on stations 4 and 8 that AMRAAMs would use, but it's also still consistent a missile that you can't do that with because some part somewhere sticks out too far in some direction. If it's #2, then it's consistent with a missile that either weighs too much or doesn't fit the space by the little door because some part somewhere sticks out too far in some direction. Either way, unless it just means six of them actually can fit internally just like with AMRAAMs and they just didn't think to mention that (as does happen sometimes when people are talking about F-35 carrying AMRAAMs), it could mean that whatever keeps them from putting six in an F-35 could also be something that interferes with putting them in an F-22 (or at least with putting six of them in there).